These intriguing little squirrels have a large fold of furred skin stretching from their forefeet to their hind feet which they spread out like a parachute and glide from tree branch to tree branch, thus their name "flying squirrel"! The Southern Flying Squirrel or American Flying Squirrel is the squirrel most commonly found available in the U.S. pet trade. They are the littlest of the squirrel species with only a 3-4 inch long body. Their tiny size, along with a natural tendency to want to rustle around or even snuggle up and sleep in your pocket, makes the Flying Squirrel a perfect "pocket pet". At first, Flying Squirrels are very shy when meeting new people. A young squirrel that has been raised in captivity or taken from its mother at weaning time will accept handling the easiest. Flying Squirrels are nocturnal so after sleeping all day, these little fellows will be very playful and full of energy from dusk to dawn. To keep their muscles strong they not only need places to play, but need a regular opportunity to glide. Putting your pet up on a high shelf and letting it glide back to you will be rewarding for both of you! 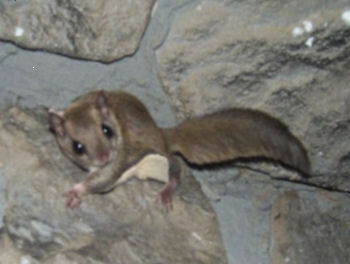 Background: Southern Flying Squirrels are found mostly in the Eastern part of North America, inhabiting parts of Canada, the United States, and Mexico. Southern Flying Squirrels or American Flying Squirrels are just 7-8 inches long (with 4" of that being the tail), and they weigh just 3 ounces when fully grown. Their fur is silky and has soft dense undercoat. Their overall appearance of their fur is mostly rusty-brown or grayish-red, with a lightly colored underbelly. But upon close inspection the hair is a actually a mixture of several colors including gray, red, and beige, and there is a soft gray undercoat. They rest in the hollows of trees during the daytime, and will search the treetops for food after dark. Their natural foods consist of insects, birds' eggs, nuts and various kinds of fruits. They not only have 20 regular teeth, but like all rodents, they have sharp incisors that continually grow, and will need hard chews to keep them worn down. The female will produce a litter of three to six young twice a year. feet! They often make sharp turns just before landing. work great for both these needs. Dr. Jungle chuckles...."wow Tinkerbell sure livens up her new family's life! "This was her first Christmas. My husband and I love her just like a daughter. She is so cute! Tinkerbell loves to play on our curtains in the living room, coming down to play with us or see if we have something to eat!" Tinkerbell is a female Southern Flying Squirrel. "One of her favorite foods is sugar snap peas. Of course she also loves cashews, pecans and whole un-shelled peanuts. We have flyers,fox and grey squirrels available for sale. i and my wife breed these squirrels in a small scale though. So they are limited in supply. These babies are well socialized,hand raised,healthy and now ready for sales.We ship nationwide. Shipping or delivery available nationwide to any major airport near you. These gentle tiny squirrels are true “pocket pets”. Flying squirrels form a deep bond with their human owner and enjoy spending hours climbing around or sleeping in their owners clothing. Squirrels are nocturnal but will adjust slightly to their owners and spend time awake with them. A gliding membrane which extends from front leg to its back leg is stretched out and allows the squirrel to glide from perch to perch for up to 150 feet! It's large eyes, loving nature, and gliding ability make it a popular companion. A good cage is a medium size bird cage, at least 2'x2'x4'. Bar spacing should be no more than 1/2" wide. Provide plenty of non-toxic branches, hanging pouches and sleeping areas for them. You can use cotton, or hamster nesting material for nest boxes. It is important to acquire your baby squirrel at no more than 8 weeks of age and carry them in your shirt pocket or in a bonding pouch for several hours a days for at least two to three weeks. Squirrels can be affectionate and loving pets if cared for properly and acquired at the right age. Hand feedings and daily handling is crucial in the first few weeks after you receive them to ensure proper bonding. It is relatively easy to bond with a new baby but is very challenging if you receive an older adult who is not bonded to you. You must have PetAg or Esbilac canned puppy milk replacer (carried at Walmart) on hand prior to receiving your baby squirrel. Other brands of canned puppy milk would be acceptable if unavailable. Once opened the can must be discarded after 3 days, several cans will be necessary. Hand-feeding is necessary for the bonding process of a Squirell. However, since improper hand-feedings can be fatal, it is important that a responsible adult do all the hand-feedings. When you receive your baby it will already be accustomed to hand-feedings and will be ready to eat when they get home. A proper feeding should last 6-10 minutes. The minimum amount of feedings is 3 times a day, but if you can feed them more often it is recommended. A typical feeding is around 3-5 full syringes. They may eat less the first day, which is normal. Do not ever force them to eat more. Squirrels are very active will require exercise and activities to avoid becoming overweight or sick. A solid plastic wheel in the cage is a great exercise tool. You should spend time with your Squirrel as often as you can outside of their cage. We recommend getting two squirrels because they are social and can get lonely which can lead to behavior problems. This is not a requirement, we have many clients with only one squirrel that lives happy and healthy. Overall they make excellent pets, can be handled and cared for by the whole family. I have a female flyer that I found and raised from pup. Looking for another female. Tampa Florida .